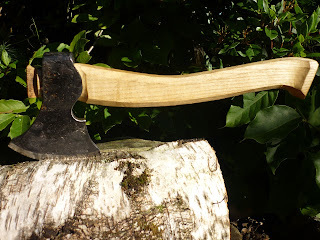 Just before New Year I decided I needed to straighten up the helve on my Axe. The first incarnation was a lovely curved affair. But I wanted to change it for a straight helve, much like my H.Roselli Axe. With a straight helve, the cutting edge is presented to the work at the same attitude no matter where your hand is on the helve. There is a full helve replacement tutorial here on my blog. It is important to recess the helve to allow for a curved cheek. You can make a nice accurate recess if you mark out with a compass or something similar. The Poll needs seating as well. Once a good tight fit is achieved it's time to saw a slot for a peg. I chose a piece of Mahogany from the 'Cutty Sark' tea clipper. Hammer or press it home. 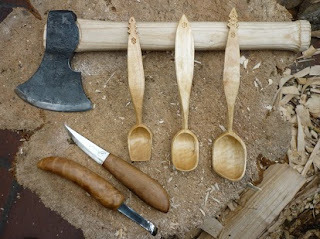 And now it feels part of me when I rough out spoon blanks. If you wish to purchase any of my work.